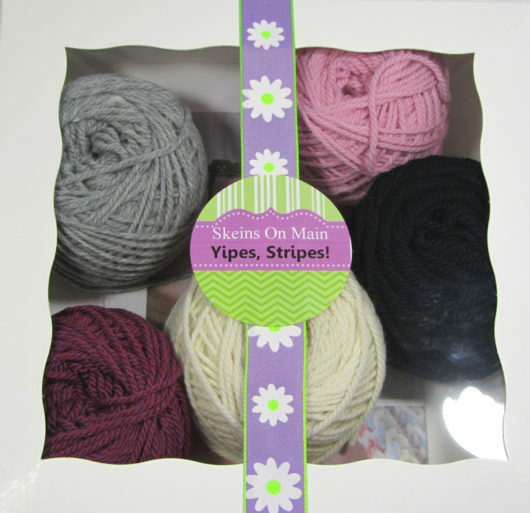 This little package definitely caught my eye at one of my local yarn shops, Skeins on Main in Rochester, Michigan. It’s a great shop. But more important, for present purposes, this was a fun kit to knit up. There was plenty of yarn, in all the colorways. The yarn is Stonehedge Fiber’s Shepherd’s Wool worsted. 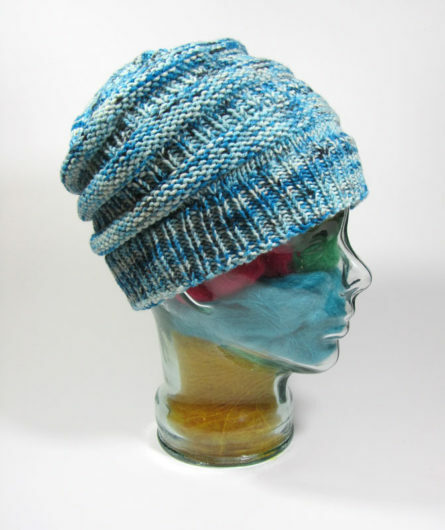 It’s a “pure Michigan” product, in next-to-the-skin soft merino. I had 63 grams left, which I calculate as about 135 yards. 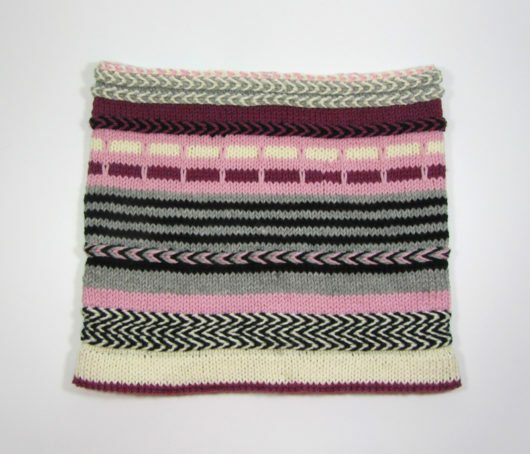 The pattern is “Yipes Stripes Cowl” by Ann Weaver. My kit didn’t tell me what color to use where in the pattern. It looked to me, though, that the yardage for each color was the same. I used: A=wine, B=white, C=black, D=pink, and E=gray. The pattern’s directions for the Latvian braid are excellent. I hadn’t done the braid in a month of Sundays, but I didn’t even need to consult a video. One hint? Try to work the 2nd row of each braid without untangling the yarns, because the 3rd row is worked with an opposite twist, which untwists the yarns as you work. 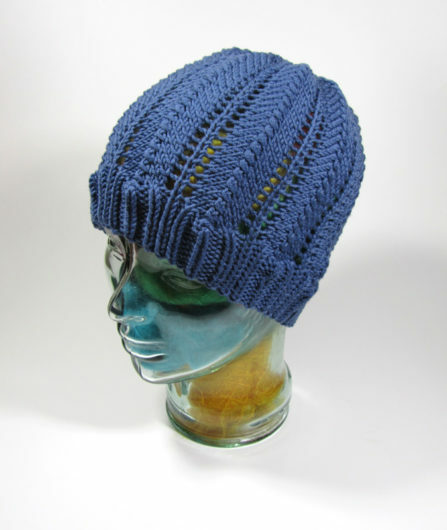 There’s one 3-color Latvian Braid, in a prominent mid-cowl placement. Blocked lightly, this is a 12.5 inches square cowl. Here’s a closer look. 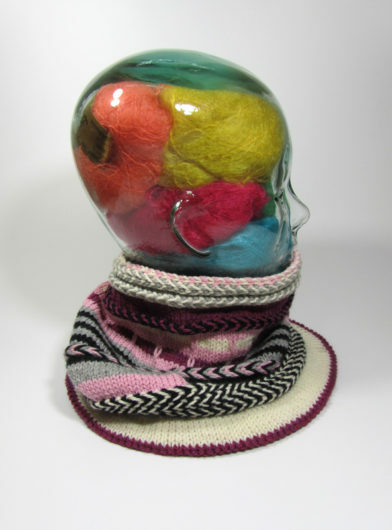 Next up is Callowhill Cowl, by Erika Flory. 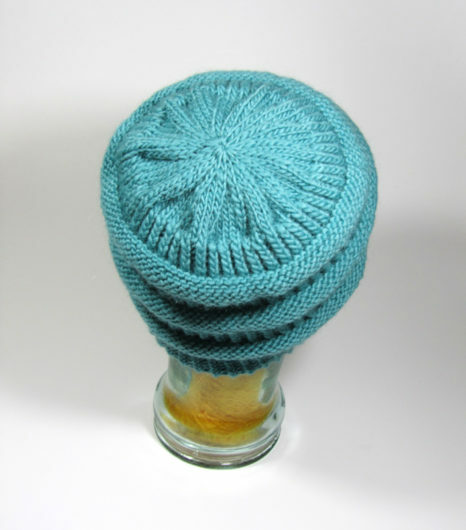 It’s available here and seems to be an exclusive to Craftsy. Craftsy is kitting the pattern with Cloudborn Superwash Merino DK. I’ve not knit with it before this. In fact, I never heard of the yarn before seeing it on Craftsy at such a low price that it was an offer I could not refuse. At the moment, the pattern and the yarn sell as a kit for $11.70. $11.70? How does that happen? I can’t given the yarn a rave review. But, I didn’t encounter knots. There was an occasional bit of fuzz that clung to the yarn. 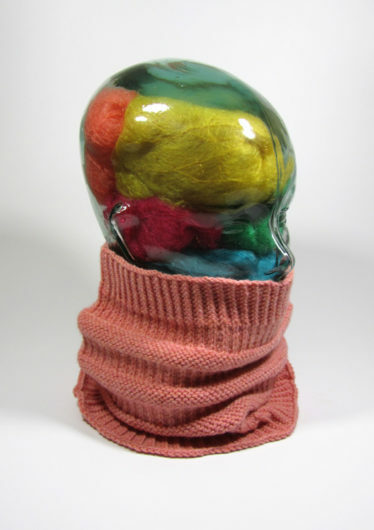 But it picked off easily and didn’t compromise the integrity of the yarn. And, good golly, Miss Molly, they are practically giving this yarn away! My colorway is Ocean. This is a small circumference cowl. Be sure to use a very stretchy bind-off. I used Jenny’s Surprisingly Stretchy Bind-off and that turned out to be an excellent choice. If you haven’t used JSSBO before, Cat Borhi’s “how to” video is excellent. This next one is a super-easy, knit-while-you-chat cowl: Melissa Sibley’s Grinchy Cowl. Again, this is Stonehedge Fiber’s Shepherd’s Wool Worsted. The only modifications I made were that I cast on 120 instead of 110 stitches and knit one extra repeat of the 15-round section, to give the cowl some extra height. If I make this again, I will end the slip stitch sections (yes, there is a tad more to this pattern than first meets the eye) after a knit row. I think that will decrease the bit of bunchiness on the underside of the purl row sections. An extremely simple cowl to knit. And there’s something to be said for that, for sure. Black Sheep Knitters Guild had its annual “Brown Bag Swap” a few months ago. You probably already know how that goes. Bring a gift, pick a gift, steal somebody else’s gift, or pick a new one. I generally favor the strategy of picking a gift that isn’t nicely wrapped. After all, maybe you can tell a book by its lack of cover. It’s a fun diversion. I’ve never knit with Bad Amy. This Indie dyer‘s yarns tend to sell out quickly. And she runs yarn clubs that have a lot of competition to get into. 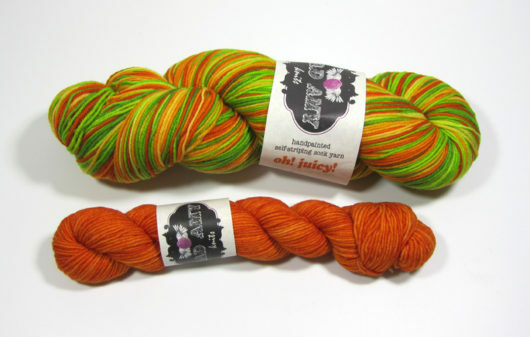 Someone-who-will-not-be-named put this self-striping skein of the “Oh Juicy” colorway into the swap. Oh Lordy! A gift can only be stolen twice and then it lands where it landed. Oh Juicy was chosen. But the giftee didn’t get to keep it. Steal #1. When my swap number was called soon after, it was Steal #2. And so Oh Juicy stayed with me. Lovely stuff. 80% merino, 20% nylon. Should hold up well. This is my Oh, Juicy knit up in Virginia Rose-Jeane’s great free pattern, Vanilla Latte Socks. 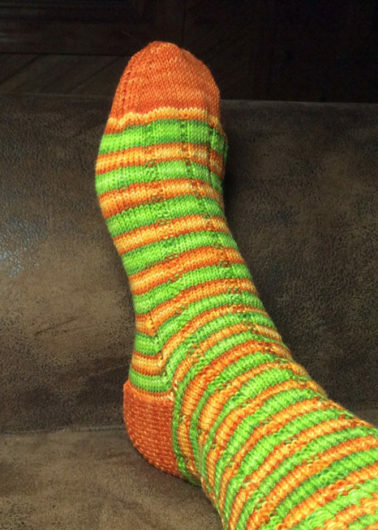 It’s one of the most knit free sock patterns on Ravelry: 7685 projects posted. 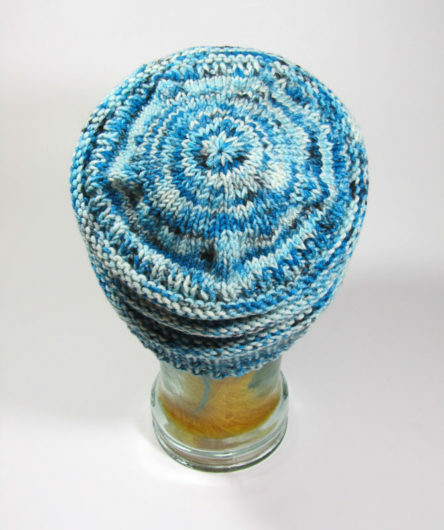 It is top-down knit, designed to be worked on magic-loop or two circulars. But it is very easily adaptable to double pointed needles. That’s my preference. I knitted the largest size, on 72 stitches, using US size one needles. I chose the “eye of partridge” stitch for the heel and the rounded toe. And, if the sock fits, wear it. These are mine, for sure. The skein is generous. I needed only 14 grams of the 25-gram contrast yarn. And I had 20 grams left of the 100 gram skein of the main color. There was enough yarn left for an Oh, Juicy bear. 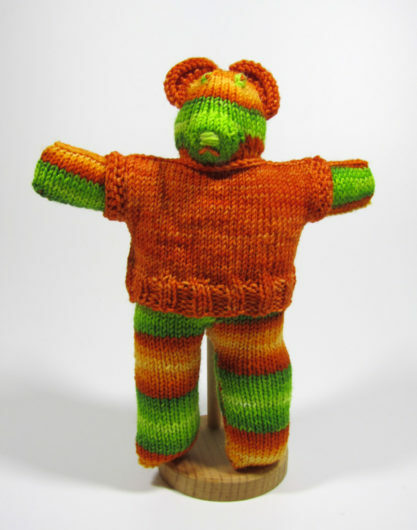 This is my old stand-by bear pattern, from Lesley Ann Price’s “Kids Knits” book. You’ll have to search the library stacks to find that one. Thirteen of the eighteen Rav project pages on this bear are mine. And that’s not all I’ve made. In the last 20 years or so, I’ve probably knit a hundred of these guys! The bear is knit flat, in one piece (after you join the legs on the needles). Very little seaming. Piece ‘o cake. My Juicy has already been gifted to a little guy. Blues. It’s too soon for the real wintry blues, since winter is only just getting revved up here in Michigan. But blue hats. 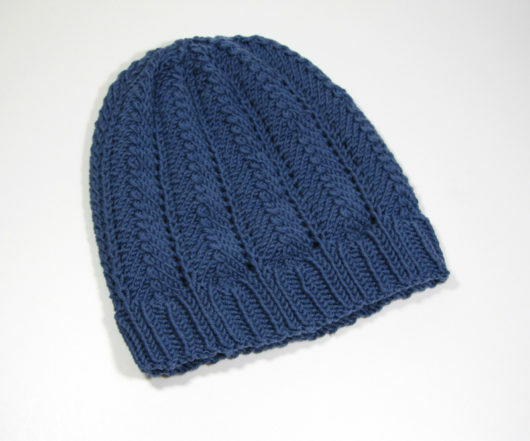 Well, blue hats seem to be leaping off my needles. This one is Dani Sunshine’s Rockhound. One of her free patterns. Anything feathery and fanny is fun for me. 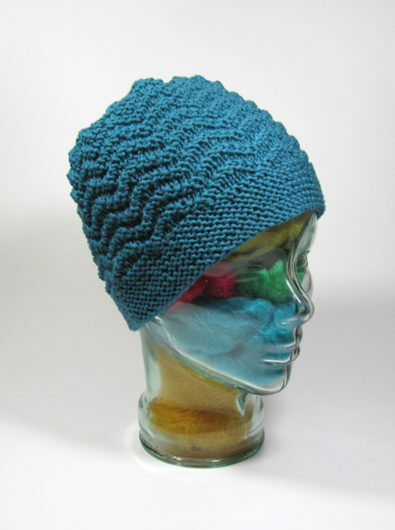 This is knit up in Plymouth Yarn’s Worsted Merino Superwash Solid. Excellent stitch definition. 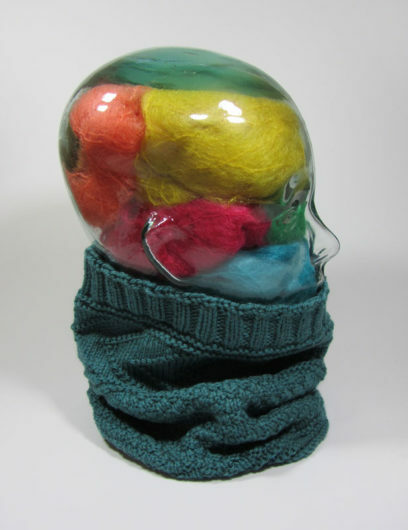 Glass head likes how well it works with her blue vintage mohair cheekbone. Here’s a look at the nicely rounded crown. This next bit of blue is Speargrass, in another shade of the same Plymouth worsted superwash I used for Rockhound. 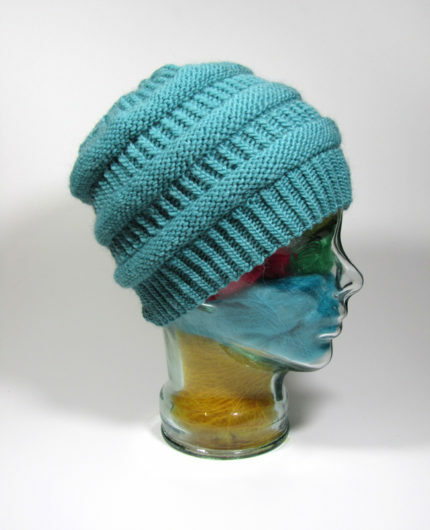 It’s another free pattern, this time by Susie Gourlay. How cool is that? Possibly, very cool. “Holey hats, Batman!” But not every hat has to be super-warm. This one is a lot of fun to knit. And the pattern is easily memorized. 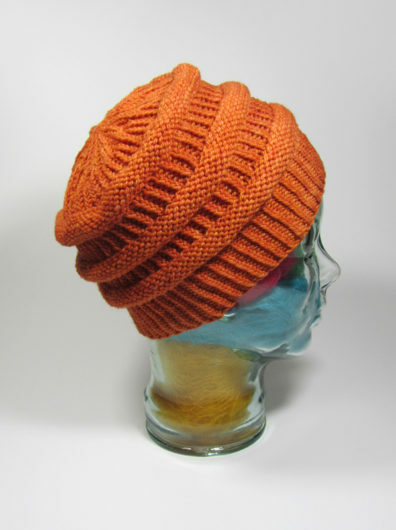 At first I thought that I didn’t care for the way the ribbing transitioned into the body of the hat. 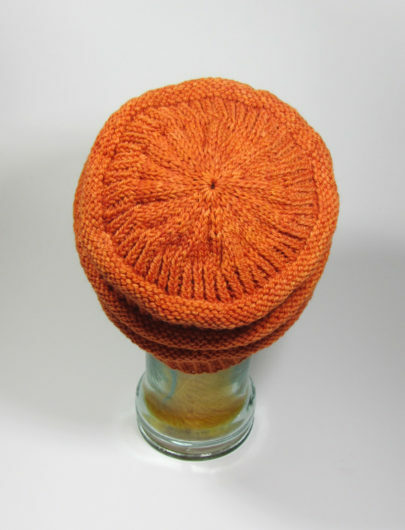 And next time I might try knitting a round to make the transition to the body a little more defined. But the more I look at it, I sort of like the added texture. Here’s another view, this time off-the-head. The crown decreases lay nice and flat and maintain the pattern well. In those last few rounds, that’s not easily done. But it looks neat. And anyway, the very tops of hats aren’t visible. Well, unless they suffer from PHS (Pointy Hat Syndrome) and this hat doesn’t. Next up is another freebie, “Jaye a Copy of CC,” by Elaine Long. I had no idea who or what CC referred too. About the only thing I know about current popular culture is what can be gleaned from HGTV. (What waterfall islands are, that everyone wants “open floor plans,” and that for some reason parents now want to be able to see their kids all the time when kids are playing in the house.) But, the internet teaches that the CC Beanie is Colorado Chick‘s. Hopefully imitation, especially with attribution, remains a sincere form of flattery. 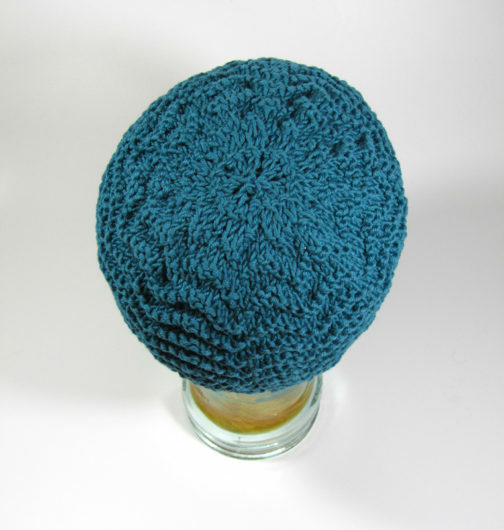 My Jaye is knit in, you guessed it, Plymouth Yarn Worsted Merino Superwash, this time in one of their hand-dyed hanks. The rim is doubled, which will definitely help eliminate cold ears. The crown decreases work well. My only modification was to continue the decreases a few extra rounds so that there would be fewer stitches to gather at the top. 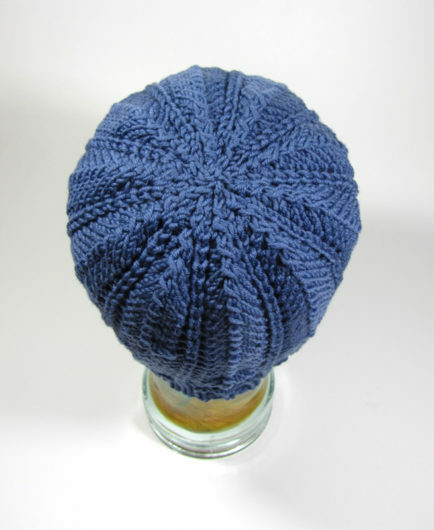 Here’s my favorite hat of this style: Aimee Alexander’s Central Ave. It’s not a freebie, but the few extra touches make it worth the purchase. 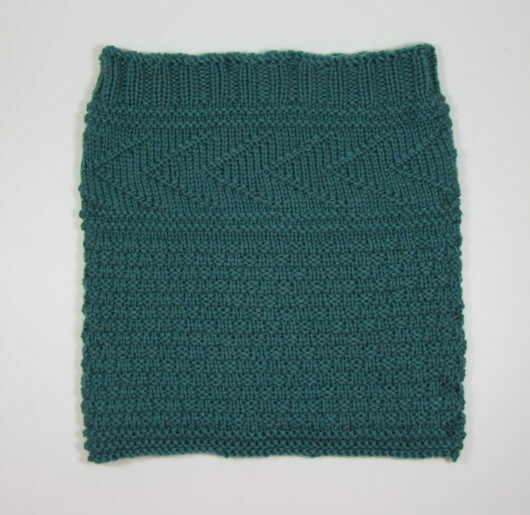 Alexander’s pattern uses an easy “trick” to get the reverse stockinette ridges to pop nicely. Same for the twisted rib. Great pop factor. And the crown decreases are well-organized too. Even though I knit this one in Brown Sheep worsted, which made it a bit stiff, I am very pleased with how it worked out. It disappeared quickly from my holiday pick-your-gifts stash. In fact, as soon as I finished my Central Ave in Brown Sheep, I cast on for another. This time in Swans Island Natural Colors Merino Worsted. I can be forgiven for that purchase because I bought the skein at half price, which made it only twice more expensive than seems right. Not so. Organic. I get it. Oops. Not blue. So not blue. The colorway is Bittersweet. By now, I figure we’re sick of the blues anyway. Central Ave is an especially satisfying easy knit. And reports are that people who don’t tend to look good in hats, look good in Central Ave.